A bullish movement in AUD/USD has pushed a number of technical indicators into the over-bought territory. As I will demonstrate below, the AUD/USD may very well be heading for a reversal, as a bearish cross has taken place on the Slow Stochastic. In addition, the Williams Percent Range and Relative Strength Index indicates that the price of this cross currently floats in the overbought territory, signaling downward pressure. Forex traders can take advantage of this impending movement by having their Entry Orders in place to capture this reversal. Don’t forget your Stops and Limits! Oil prices advanced 1.49% against the USD for the 24 hour period on Friday, ending 23:00GMT, closing at 98.24. Oil advanced as the worsening situation in the Middle East stirred renewed concern about disruptions to oil production. At GMT 0400, Oil is trading at USD 99.59 per barrel in the Asian session, 1.37% higher from 23:00GMT. The pair has its first resistance at 100.86, followed by the next resistance at 102.14. On the other side, the first support is at 97.26, with the subsequent support at 94.94. After spending the last week in a prolonged upward trend, it appears that the AUD/USD pair may have finally hit a significant resistance line. Technical indicators are showing that the pair is likely to turn bearish in the near future, providing forex traders with an excellent opportunity to jump on this trend from the beginning. We will be looking at the 8-hour AUD/USD chart provided by ForexYard. The technical indicators being examined are the Williams Percent Range, Relative Strength Index and Stochastic Slow. 1. The Williams Percent Range is currently approaching the 0 level, indicating that the pair is well into the overbought zone. Typically this is a sign that a downward correction is forthcoming. 2. The Relative Strength Index, currently just below the 80 line, has just crossed into overbought territory. This lends further evidence to our theory that a bearish move is likely to occur. 3. Finally, the Stochastic Slow has formed a bearish cross. With both indicator lines pointing downward, it appears that a downward correction may occur very shortly. FX price action showed little conviction during the Asia session, an understandable reaction to the general lack of news flow. EURUSD traded 1.3712-1.3767 and USDJPY traded 81.62-81.76. Our team of analysts now expects the RBNZ to cut the OCR by 50bp at the upcoming policy meeting, in response to last week’s tragic earthquake. Brent crude pushed even higher on supply concerns, and is trading at $113.88/bbl at the time of writing; gold is hovering at $1413.95/oz. Fed Governor Yellen did not sound excessively concerned about higher oil prices, noting that oil price shocks have historically generated few second-round inflation effects in the US. Richmond Fed President Lacker, a non-voter in 2011, said that oil price gains so far do not pose a risk to the economic recovery. Our US economists agree and, on Friday re-affirmed their US growth forecasts for 2011. Reinforcing their view, they note that the University of Michigan consumer sentiment reading for late February rose to 77.5 from 75.1 (cons. 75.4) despite higher oil prices. US Q4 GDP growth was revised down to +2.8% from +3.2% annualised rate. Attention now turns to Fed Chairman Bernanke’s congressional testimony on Tuesday and Wednesday for any guidance on the future of the Fed’s bond-buying program. ECB Vice President Constancio said central bankers must be willing to be pre-emptive, and that the ECB remains extremely vigilant on inflation expectations. Nevertheless, he downplayed speculation that the ECB might be forced to react to the recent increase in oil prices saying that “monetary policy does not respond immediately to such a supply shock, nor should it”..
ECB Governing Council member Draghi said central banks are currently trying to assess whether the spike in oil prices will have a permanent effect on inflation or whether it is a one-off shock. He noted that mid-term inflation expectations remain well anchored, but that the appearance of “inflationary tensions” requires careful assessment of “the timing and methods for restoring normal monetary conditions and interest rates”. He stressed that the ECB must prevent “the stimulus of international prices from passing through to domestic prices and wages in the longer term”. Ireland’s general election took place on Friday, and counting of votes continues. At the time of writing 150/166 seats have already been filled and, in line with opinion polls, opposition parties have made large gains. Fine Gael leader Kenny said he would begin provisional talks this week with European officials on possible adjustments to the terms of the EU/IMF financial support Packaged. BoE Deputy Governor Bean showed no sign that he might vote for a rate hike in the near future. Rather, he fully aligned himself with Governor King’s view that higher commodity prices, a VAT hike, and sterling weakness are largely to blame for high UK inflation. We believe Thursday’s ECB press conference in particular poses upside risks to EURCHF, given that President Trichet may sound even more hawkish. Second, the SNB has continued to lower short-term money market rates, which will likely support EURCHF by widening the rate differential with the Eurozone. Finally, the Swiss franc has been boosted by risk aversion over the past few days. However, unless tensions spread to some of the larger countries in the Middle East, market jitters may ease, leading to the reversal of some safe-haven inflows to the Swiss franc. Our team of analysts changed their RBNZ forecast in the wake of last week’s tragic earthquake. He now expects a 50bp cut to the OCR on March 10, and notes that it could take 6 months or more for this emergency cut to be withdrawn. Previously, he had been looking for the next 25bp hike to come in September. Finance Minister English said the government would largely bear the cost of the rebuilding effort and would issue more short-term debt to pay for it. Earlier Prime Minister Key distanced himself from the idea of imposing a levy, saying that doing so would slow the economy. Key estimated the total cost of earthquakes since September at N$20 bn, equivalent to about 10% of GDP. Finance Minister Flaherty said he sees no reason at this stage to be especially concerned about long-term inflationary effects as a result of higher global oil prices. EURUSD BULLISH Rise through 1.3838/62 would expose 1.3948. Near term support is at 1.3649. USDJPY BEARISH Push below 81.13 would expose 80.93. Initial resistance defined at 82.52. GBPUSD BULLISH Initial resistance is at 1.6255 ahead of 1.6279/99 zone. Support is defined at 1.6031. USDCHF BEARISH Downtrend continues with focus on 0.9200 and potential for 0.8951 next. Near-term resistance at 0.9392. AUDUSD BULLISH Pressure on 1.0200 initial resistance; next resistance at 1.0256. Support lies at 1.0002. USDCAD BEARISH Outlook is bearish; the pair eyes 0.9745/12 zone. Near-term resistance at 0.9816, previous low. EURCHF BEARISH While resistance at 1.2958 holds, expect losses towards 1.2706. Move below this level would open up 1.2686/1.2592. EURGBP BULLISH Break of 0.8593 would expose 0.8619. Near-term support lies at 0.8470. EURJPY NEUTRAL Model has turned neutral; 113.46 and 111.38 mark the near-term directional triggers. Crude oil rose, capping the biggest weekly gain in two years, on concern that the turmoil in Libya will spread to Middle East petroleum producers. Grains jumped, driving a measure of raw materials up to a record. The standoff between an increasingly isolated Libyan strongman Muammar Gaddafi and rebel factions now in control of oil-rich eastern Libya has cut output in the world’s No. 12 crude exporter by at least 25%, or 400,000 barrels a day. Last week, oil jumped 14%, the most since late February 2009. The price has climbed 25% in the past 12 months. As for the week ahead, traders’ attention should be devoted to all developments from the Middle East, as this is likely to continue to play a leading role in commodities trading. Traders should take under consideration that as long as the unrest in the region remain, crude prices might be further supported. Spot gold inched up on Monday, heading for its best month since last August, boosted by fears over the deteriorating situation in Libya and spreading violence in the region, supported by rising oil prices. Political turmoil in the region has been supportive of gold prices in recent weeks. Gold was poised to stage a monthly gain of 6%, its best since last August. Spot gold inched up 0.3% to $1,416 an ounce, extending gains from the previous session. Scenes in Libya, where protesters intensified their campaign to force Muammar Qadafi to quit, have encouraged some safe-haven buying of gold, although this support is unlikely to last long. Last week’s most notable trends were the bullish Japanese yen and crude oil. Both trends took place in response to the rising violence in Libya, which has by now cut two thirds of its oil supply. While the Libyan turmoil is likely to affect this week’s session as well, another significant news event will have a large impact on the market; the U.S. Non-Farm Payrolls. The U.S. dollar slid against most of its major currency counterparts during last week’s trading session. The dollar fell about 100 pips vs. the euro, and the EUR/USD pair crossed the 1.38 level for the first time in almost three weeks. The dollar also fell about 150 pips against the Japanese yen. The dollar weakened last week after several economic indicators from the U.S. provided better-than-expected figures and as a result supported demand for higher-yielding assets. Sales of U.S. previously owned homes unexpectedly rose in January to the highest level in eight months. Purchases increased to a 5.36 million annual rate, beating expectations for 5.22 million. In addition, confidence among U.S. consumers rose in February to the highest level in three years. Both indicators signal that citizens in the U.S. became more optimistic about their income and the economy. Looking ahead to this week, many interesting releases are expected from the U.S. economy, most significantly the Non-Farm Payrolls, which is scheduled for Friday. Other significant news releases that traders are advised to follow are the Pending Home Sales, the Manufacturing Purchasing Managers’ Index, the ADP forecast for the Non-Farm Payrolls and the weekly Unemployment Rate. The euro strengthened against most of the majors currencies during last week’s trading session. The 17-nation currency gained about 100 pips vs. both the U.S. dollar and the British pound. As a result, the EUR/USD par climbed above the 1.3800 level, and the EUR/GBP cross was trading near the 0.8600 level. The euro climbed against most of its rivals after reports have shown that the German economy is recovering at a faster pace than previously estimated. German business confidence unexpectedly rose to a new record high in February. The survey rose to 111.2 from 110.3 in January, beating analysts’ expectations that the end result will remain at 110.3. In addition, new industry orders in the euro-zone also unexpectedly rose in December, reaching their highest level in almost two and a half years. Another reason for the euro’s bullishness is the ongoing speculation that the European Central Bank (ECB) will hike interest rates in March in order to fight rising inflation. As for the week ahead, the most significant economic release from the euro-zone will surely be the Minimum Bid Rate, which is scheduled for Thursday. This is the ECB’s interest rates decision for March. If the ECB will indeed decide to hike rates, the euro may see another bullish session this week. Traders should also follow the euro-zone’s Consumer Price Index (CPI) reports which are expected today. The CPI is considered to be the most reliable inflation gauge, and the result is likely to have a significant affect on the ECB’s interest rates decision. The Japanese yen rallied against all of its major currency rivals during last week’s trading session. The yen gained about 150 pips vs. the U.S. dollar, and the USD/JPY is currently trading near the 81.70 level. The Japanese currency also climbed about 150 pips vs. the euro and about 250 pips against the British pound. The yen strengthened last week as investors sought stability in light of the uprising in Libya. The violence in Libya has boosted the uncertainty in the market, and as a result turned investors to look for safe-haven assets, such as the yen and the Swiss franc. It currently seems that as long as the violence in the Middle East will continue to spread, demand for the yen as a safe asset will increase. As for this week, traders are advised to follow the leading releases from the Japanese economy, as they are likely to have a large impact on yen trading. In addition, traders should follow the developments from the Middle-East, especially from Libya, as the unrest there has potential to further boost the Japanese currency. Crude oil prices are once again rising. After crude corrected some of its gains and fell from the $103.30 level to $96.35 a barrel, the commodity is opening this week with another bullish move, and is currently trading near $99.60. Crude oil prices are rising in light of the protests in Libya. The uprising has already cut the nation’s output, and currently it seems that Libya’s leader Muammar Qaddafi has lost control over much of his country. In addition, the main concern is that the unrest in the Middle East will spread to other parts of the region and will significantly damage global oil production. As for this week, traders should first and for most follow the developments in the Middle East, as this issue will continue to impact oil prices in the near future. Traders are also advised to follow the U.S. Crude Oil Inventories report, which is scheduled for Wednesday, as this report tends to have a direct impact on the market. The EUR/USD pair recently peaked at the 1.3835 level. The pair has since entered a bearish correction, and is currently trading near the 1.3750 level. A bearish cross on the 4-hour chart’s MACD suggests that the downward movement will continue. Going short seems to be the right choice today. The pair has been dropping consistently for the past few days, and the cable is now trading near the 1.6085 level. In addition, both the Slow Stochastic and the MACD are providing bearish indications, signaling that the downward move has more room to go, with the potential to reach the 1.5980 level. A very distinct bearish channel has formed on the 4-hour chart indicating the pair could see a correction. In addition, a bullish cross on the Slow Stochastic indicates that an upward correction might take place today. Going long with tight stops might be the right strategy today. The pair is in the middle of a very strong bearish move, in which it fell about 550 pips in the past two weeks. 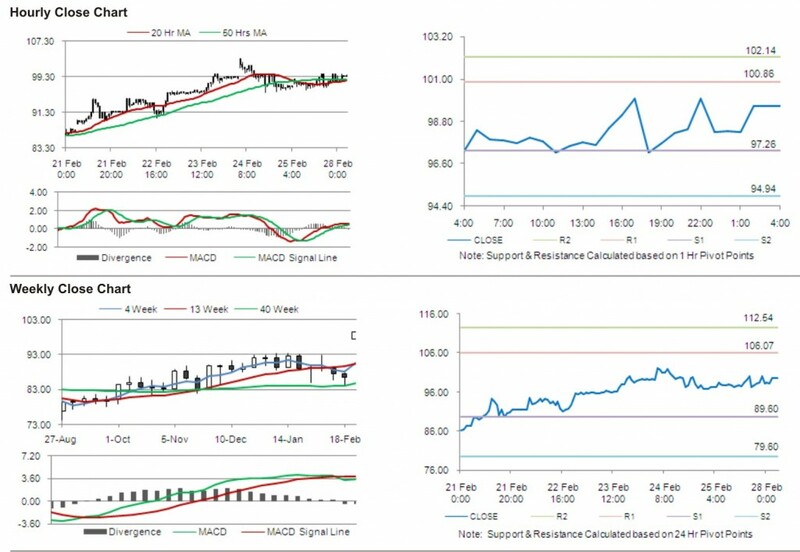 In addition, as both the MACD and the RSI continue to point downwards, it seems that another bearish session may take place today. Going short appears to be the preferable choice today. During the past several weeks, crude oil prices jumped from $85.00 a barrel to over $103.00. Currently, as all oscillators on the weekly chart are providing bullish signals, it seems that the commodity’s bullish momentum has more room to grow. This could be a great opportunity for forex traders to join a very popular trend. Currency trading education is a very important aspect of foreign exchange trading. Since there is a huge potential for loss as well as gain, it is recommended that you continually delve into the education aspect as well. The education begins by understanding what currency trading is and how it works. As some of you already know, currency trading is the exchange between two different currencies. Currencies are always traded in pairs because the actual profit or gain comes from the difference in value between the two. Common examples include GBP/USD, EUR/JPY, and USD/CAD. Websites for trading platforms and currency brokers usually provide informational materials and instructional videos or articles for the perusal of traders, both experienced and beginners. These websites also have helpful forums and blogs where interested participants come together for discussions and queries in the form of posts or comments. A lot of insight can be gained by reading the posts in these areas. However, they can also provide the backbone needed for successful trading. Before deciding to spend cash on actual trading, be sure to understand how trading platforms work and how the currencies are traded. Since many trading platforms provide demo accounts, practice with a fake account first and put into action the tactics and concepts you have learned. A fake account is very helpful in teaching users the basic skills needed in trading since it does not involve real money. After experiencing successful trades, begin trading with minimal amount of cash. Use only that which you can afford to loss and never play big the first time. Although you may have traded successfully using a demo account, be prepared to lose money as it is inevitable with some trades made. Trading with real cash provides a bigger challenge since you have to control the pressure of losing. In some instances, traders trade currencies too quickly due to the pressure of losing and regret the decision later on. Anticipating the correct timing is important in every trade, so do not be hasty. Although you have grasped the basics of the trade, currency trading education must continue. Learn and practice the different techniques in successful trading from experts or from other people in the same boat and find out which of them work for you. Be updated with financial trends as well and be sure to read forex news often. Learn how to interpret price action patterns, too. With proper education, guidance and determination, successful trading will be the main prize. Any good investor must read forex news online regularly, just as you check forex trading reviews on a regular basis. If you are just a beginner in the forex trading arena, you need to be very careful that you do not develop the habit of being too hasty when investing your money in the forex market. In fact, it is very crucial that you must first learn the ins and outs of the currency trading business before you even try to get your feet wet. There are many factors that you really need to understand first with regards to trading currencies. Some examples of factors that you need to have good knowledge about are leveraging, currency rates, forex charts, and several more different things involved in the process of trading currencies. After accumulating as much knowledge as you could, you will also need to develop a plan and strategy of your own. Something that will serve as a sort of guideline to you and direct your trading activities so that you can avoid losing a lot of your investments by mistake, but instead generate the return of investments which you so expect. One good quality of an investor that you need to adopt as a novice in this trading business is the quality of being diligent and focused. A good investor is somebody who watches over his investments like a hawk. The foreign exchange market is a highly volatile industry to work in, and if there is one place that any investor could easily lose a lot of money if he is not careful, it is no doubt the forex market. That is why the discipline of constant monitoring and steady tracking is much needed by a trader in order to turn those investments into profits and not just lose them. Another important skill that you need to master as a trader is the ability to hold your emotions intact, even when you have all the reasons in the world to make sudden reactions. The forex marketplace is very liquid in nature, one second it’s on upward trend, and the next second it’s on a fast downward trend. If you act impulsively based on your emotions, then don’t be surprised if you get too emotional later on as a result of the decision you just made. You need to be very professional when dealing with the forex market. Every decision and action must have solid foundation that is based on facts and figures. Gather as much data and info you can get and then take time to study and analyze the given data. Never rely on instinct, but rather rely on the numbers presented before you. Up to the minute trade forex news are what keep traders sharp in the market. Forex review opinions should further enhance a trader’s sharpness in trading.